The 2010 Census concluded that the State of Utah was to be given a fourth Congressional seat in the U.S. House of Representatives. In adding this fourth seat, the district lines must be redrawn. The following maps have been drawn according the the UCC’s Guiding Principles. This is known as the “donut plan,” which includes three urban districts surrounded by a rural district. This plan illustrates the stark reality of Utah’s population distribution. Three-fourths of Utah’s population is concentrated along the urban areas of the Wasatch Front in Weber, Davis, Salt Lake, and Utah counties. This plan largely separates urban and rural interests by concentrating congressional representation and district alignment exactly where the most people reside. Salt Lake County is divided north-to-south among three districts, with the majority of the county comprising one district across the middle, the north part joining a district with Weber and Davis Counties, and the southern part joining a district with Utah County. As urbanization along the entire Wasatch Front increases, the kinds of urban issues which have historically been primarily Salt Lake City issues will be increasingly common in each of the Wasatch Front counties. For example, air quality and transportation issues are of particular common interest to all urban areas along the Wasatch Front. The fourth district is comprised of all remaining counties, with largely rural, agricultural, mining, and recreational interests around the state. Accordingly, the three urban districts rate high for compactness and common interests. The surrounding, rural district rates low on compactness, but high on common interests and preservation of county boundaries. Plan B proposes a horizontal division of the state, combining urban and rural interests in all but one district. 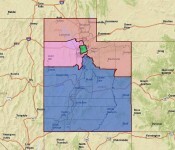 Salt Lake County is divided east-and-west, with a complete district from its east boundary to approximately 27th West. The western-third of Salt Lake County forms a second district with Tooele County, southern Davis County, and northern Utah County, which all have commercial, employment, educational, and transportation interests in common with Salt Lake County. The northern district joins the urban counties of Weber and northern Davis with the other northern tier counties from east to west. 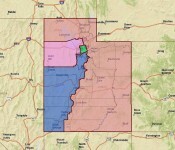 The southern district joins the remainder of Utah County with the southern tier of counties from east to west. Thus, this plan provides relatively compact and contiguous districts with common interests throughout the state, while reflecting potentially different regional interests between Utah’s northern and southern counties. Plan C is a modified vertical division of the state that includes urban areas in all four districts. Salt Lake County is again divided east-and-west, with a complete district running from the eastern boundary toward the west. The western third of Salt Lake County forms a separate district with Tooele and Davis Counties, reflecting common commercial and employment interests, including major military installations. A third district combines Utah County with a southern piece of Salt Lake County and the southwestern counties that have their population centers along the I-15 corridor, reflecting their common economic and transportation interests and the increasingly urban interests of Washington and Iron Counties. The fourth district combines the northern tier of counties with counties east of the I-15 from north-to-south. While this district is not very compact, it joins some common interests in agriculture, mining, and recreation. Plan Four, while establishing one particularly large geographical district, accommodates the north-south directional orientation of main transportation networks in southern Utah, as well as the east-west road networks in northern Utah. This configuration also presents the advantage of keeping all county boundaries intact, except Salt Lake County, which must be divided. Plan D proposes a vertical division of the state, again combining urban and rural interests in all but the Salt Lake County district. 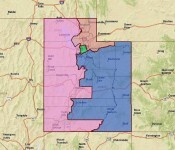 Salt Lake County is divided east-and-west, with a complete district from its east boundary to approximately 27th West. The western-third of Salt Lake County forms a second district with the western counties from north-to-south. Utah County is combined with the eastern counties to form a district from north-to-south. The fourth district is comprised of Davis, Weber and adjacent north-central counties. The western and eastern districts are not as compact, but do join complete, contiguous counties with common interests, such as agriculture, mining, and recreation. These two districts also generally follow the natural geographic boundaries between the two sides of the state and reflect potentially differing regional interests between Utah’s western and eastern counties.